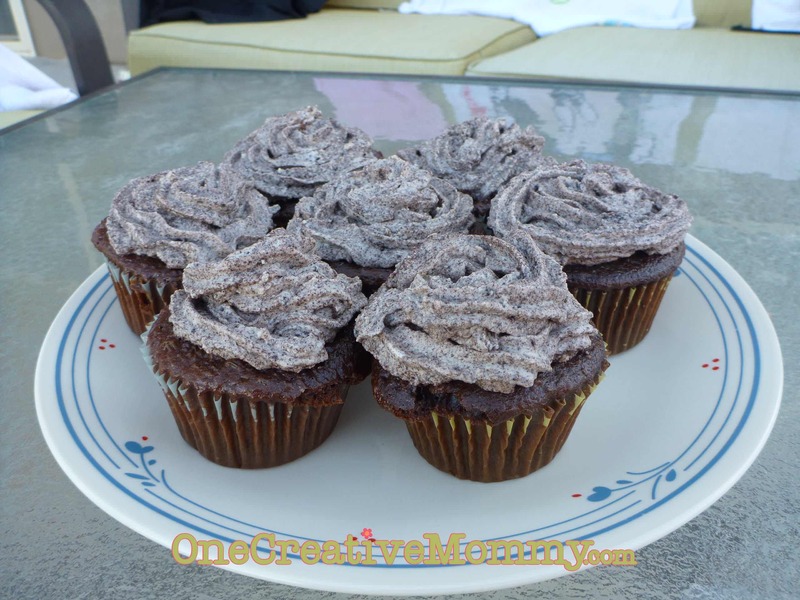 You are here: Home / All Recipes / Oreo-Stuffed Cucakes–Does it get any better? Oreo-Stuffed Cucakes–Does it get any better? Since Lu’s b-day party is later this week, I decided to go for cupcakes for the family and a cake for her party. 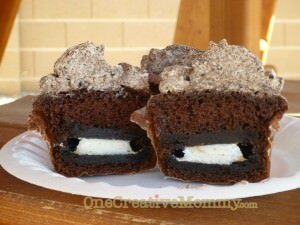 Someone brought the yummiest Oreo cupcakes ever to a fun-run this spring, and I just had to try making them! Unfortunately, I have no idea who made them. I had to improvise. Using the internet and my memory, I guessed a recipe, and it turned out great! For the cake–prepare your favorite chocolate cake recipe or mix and follow my directions. Step 1–Line the pan with baking cups and fill with just enough batter to cover the bottom of each cup. Step 2–Place an Oreo in each cup. (Mine were double stuffed, but I think any kind of Oreo would work.). Step 3–Pour in remaining batter (you may end up with a little extra) until each cup is 2/3 (or a little more) full. Gently tap or slide pans from side to side so that the batter settles around the Oreos, and follow your baking instructions. Cool completely before frosting. Using real decorating tools or a plastic bag with the corner cut off, pipe frosting onto cupcakes. This is the first time I have every piped frosting onto cupcakes. I’ll admit, I made a huge mess, and the cupcakes didn’t look nearly as nice (or even close to) the cupcakes I was trying to copy–but I have never enjoyed licking my fingers more!!! The frosting tastes like cookies and cream ice cream! Yum! These look amazing! Oreos are a major weakness of mine and combining them with chocolate cake sounds epic! Thanks for the recipe! Mmm these look absolutely DELICIOUS!!!!!!! Can’t get any better than that!!!! YUMMY! Thanks for linking up to TA-DA TUESDAY! was wondering, my oreos came out soft after baking, are they suppose to be hard? or is soft the normal? I just had one from a friend and it was a hard bite/crunch, but I am worried mine won’t turn out that way. Hmm. It has been a really long time since I made these, but it seems to me like my Oreos stayed somewhat crunchy. I think it would be impossible for them not to absorb a little bit of moisture from the wet batter. I don’t remember them being as crunchy as a fresh oreo, but they definitely weren’t mushy. Sorry I can’t be more of a help. I can’t make these anymore, because we had to go gluten free at my house. These are looking simply incredible !! Thanks, Winnie. They are yummy, and very messy! All of your recipes always look delicious. Your deserts are always so pretty!